(whether at KYU or DAN) level in the KUDO International Federation. DAIDO JUKU shall be eligible to hold ranks in KUDO. whatever reason, he/she shall automatically lose his/her rank as well. successful promotion examination held at the General Headquarters of DAIDO JUKU. martial arts / combat sports”. 8. Changes to the Rules shall be subject to a resolution by the General Assembly of KIF. 1. The rules set out in this document (“the Rules”) aim at establishing basic principles pertaining to the prevention of inappropriate behavior within KIF, and to the disciplinary measures associated. 2. The rules apply to all members, officials, and employees of the KUDO International Federation. 3. All members and representatives of KIF are prohibited from engaging in the prohibited acts and behaviors (“Violations”) stipulated in Art.3 and Art.4 of the Code of Conduct. 4. A person committing a violation shall be subject to disciplinary measures, in forms and degrees varying depending on the details and circumstances of the violation. When the person committing the violation is both a registered member and an officer of KIF, he or she may be subject to measures applying to both categories. he/she was in a position to do so shall be subject to disciplinary measures as well. 3 In addition to the above, measures such as suspension of KIF referee‘s qualification or instructor’s qualification, removal from official’s position in an affiliated organization, etc. are also possible. 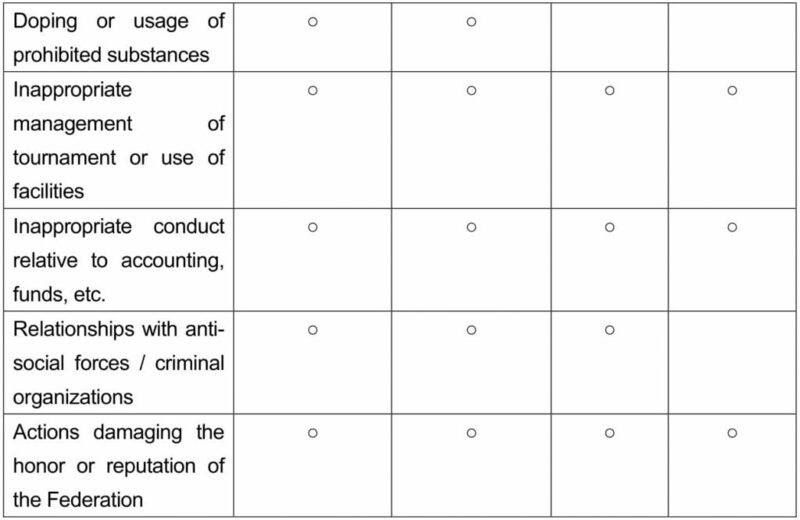 4 Guiding standards for disciplinary actions are shown below in a table. 5. When the President of the Federation becomes aware of a suspected violation whether via internal report, media report, or any other mean, he or she shall ensure that an internal investigation is launched in accordance with standards to be separately determined, with an aim at establishing actual facts and determined the appropriate course of action. 2 When deemed appropriate, the President may entrust investigations or disciplinary actions, in accordance with standard to be separately determined, to affiliated organizations or other organizations. 6. When deemed necessary to the proper handling of a suspected violation, the President shall establish a Disciplinary Committee. 2 The Disciplinary Committee shall receive from the President a report on the investigation relative to the case, and shall provide the President with proposed measures, in accordance with the standard defined in the appended table. 3 Any person suspected of violation shall be given the opportunity to defend themselves. 7. Upon receipt of proposed disciplinary measures from the Disciplinary Committee, the President shall, if deemed necessary, ensure their implementation. Implementation of disciplinary measures in the two following cases shall however be subject to a resolution by the Board of Directors. 8. In case of suspected violation by the President, the Board of Directors may decide to form a Disciplinary Committee in the same manner as describe above. The formation of a Disciplinary Committee to investigate a suspected violation by / or involving the President shall immediately be notified to the independent auditors of the Federation, as well as the result of the investigation and proposed disciplinary measures. Implementation of disciplinary measures against the President shall be subject to a resolution by the General Assembly, based on proposal by the Disciplinary Committee vetted by at least one of the auditors. 9. Appeals against disciplinary measures decided by the Federation shall be submitted to the Japan Sports Arbitration Agency or to the Lausanne Tribunal Arbitral du Sport / Court of Arbitration for Sport. 10. When deemed necessary, the President may request affiliated organizations to improve the way they operate. 11. Changes to the Rules shall be subject to a resolution by the Board of Directors of KIF. Proposed disciplinary measures should take into account the severity and intent in which a violation was committed. Disciplinary measures for repeat offenders should also take into account the existence of past violations. of ethics to be adhered to, to maintain and increase the credibility of KIF in the eye of the public. Art. 2. The Code applies to all members, officials and employees of the KUDO International Federation. Art. 3. All registered members of the Federation, its officials and employees shall abide by applicable laws and regulations, by the Articles of Association of KIF and its internal rules and regulations, as well as take into consideration society’s expectations in their actions. Art. 4. Register members of the Federation, its officers and employees shall not engage in the following acts and behaviors. In particular, people in leadership position shall hold themselves to stringent standards and be careful not to find themselves in violations. One shall not cause discomfort by inappropriate sexual behavior or expressions. People in leadership position shall not use that position to act improperly. They should also refrain from intimidation, bullying, discrimination etc. when having power as hierarchical superior, “sempai”, tournament supervisor, etc. Doping is not only contrary to the spirit of fair play, it is also harmful to the athletes’ heath and should never be tolerated. 1) Even when an athlete has no intention of committing doping, some medicine may contain prohibited substance. Care should therefore be exercised when taking medication. 2) The use of narcotics is not only antisocial but it is also harmful to the mental health and personality of the user. Such used should always be avoided. 5. Inappropriate conduct in the management of tournament or use of facilities. Any behavior that prevents the smooth running of tournaments or result in damage to facilities should be avoided. At all time, KIF members, officers and employees shall behave in a manner appropriate for representatives of the Federation and KUDO. 6. Inappropriate actions relative to accounting and handing of funds. Embezzlement, undue profit sharing bribery, fraudulent accounting and related acts are prohibited. 7. Relationships with antisocial forces / criminal organizations. All relationships with antisocial forces / criminal organizations must resolutely be avoided. Art. 5. Handling of violations to the above shall be done in accordance with the Articles of Association and with the relevant rules and regulations of the Federation. Art. 6. The Federation shall establish an internal reporting channel allowing the notification and handling of violations. Such channel shall be established separately. Art. 7. Changes to the code shall be subject to a resolution of the Board of Directors. (hereinafter referred to as “KIF” or “the Federation”). (Headquarters) – The Federation has its main office in Toshima-ku, Minami Ikebukuro 2-32-5 Eastern Building, Tokyo, Japan. (Objectives) – The Federation aims at developing and promoting Kudo, a new comprehensive, unarmed martial arts discipline created by Mr. Takashi AZUMA, founder of the Daido Juku martial arts association. Kudo is at the same time meant to be useful in actual self-defence, to carry the values of the Japanese culture found in budo (classical Japanese martial arts), to serve a social purpose of education, as well as to be a competitive sport. Through the promotion of Kudo, the Federation seeks to promote, inter alia, social education, awareness of the martial arts culture and sports, international exchanges as well as the healthy physical and mental development of the youth. The Federation is not limited in its target public, whether individuals or organizations. (Business Activities) – In pursuing the objectives set in Article 3 above, the Federation engages in the following activities as a fee-generating business related to the aforementioned specific non-profit activities. (1)ordinary members supporting the concept underlying Kudo join with the main purpose of studying and practicing Kudo (dojo students). (Becoming a Member) A person intending to become a regular member shall submit the designed application to that effect to the president of the Federation (hereinafter “ the Head Director”, see also Section 4. art. 13.(1)). If for some reason the Head Director was to reject the application, the candidate shall be informed promptly in writing and given the reason for rejection. Persons recommended by honorary members need not follow the application procedure to be admitted as members. (Admission fee and membership fee) regular members and supporting members are required to pay an admission fee and regular membership dues. In case special expenses are needed, a temporary additional membership fee can be requested through a resolution of the Board of Directors. When a member wishes to withdraw from the Federation he/she can do so at his/her discretion by submitting to the Head Director a notice of withdrawal stating the reason. (Exclusion) a member of the Federation can be expelled by a resolution of the Board of Directors for the following reasons. The member must however be given the chance to defend him/herself in front of the voting assembly. (Categories and Numbers) the Federation shall have the following governance set-up, comprised of a Board of Directors and 2 auditors. (Election of officers) members of the Board of Directors and auditors shall be elected by the General Assembly. 2. The Head Director, Deputy Head Director and Executive Directors shall be elected by the Board of Directors. 3. Spouses or any relatives to the third degree or less of an officer of the Federation may not serve as an officer of the Federation. 4. Persons falling under the cases mentioned in accordance with Article 20 of the Act may not serve as officers of the Federation. 5. Auditors may not serve as Directors or staff of the Federation. 6. Pursuant to a resolution of the board of directors, the Head Director may appoint honorary chairman, chairman, of vice-chairman persons in agreement with the stated purpose of the Federation. (Duties) The Head Director and representative of the Federation, preside over its business. 2. The Deputy Head Directors shall assist or replace the Head Director in its duties, when the Head Director is unable to fulfil them due to absence or accident. 3. The Executive Directors shall assist the Head Director and Head Deputy Head Directors, in diverse capacities. 4. The Directors shall constitute the Board of Directors, based on the resolution of which the operations of the Federation shall be decided. 5. The auditor shall perform the following duties. 1. Officers shall be elected for two four years, but can be re-elected thereafter. 3. The officers, even after resignation or expiration of their term, must perform their duties until their successor is appointed. (Replacement of vacancy) Shall there be vacancies in the Board of Directors or among the auditors exceeding a third of the normal number of officers, new officers must be appointed promptly in replacement. (Dismissal) In the below cases, officers may be subject to dismissal, such dismissal being subject to a decision by the General Assembly, provided the officer is given a chance to defend himself/herself in front if the General Assembly. officers may receive payment in the following cases, subject to it concerning less than a third of officers. 2. reimbursement of expenses required for the performance of the officer’s duties. 3. matters necessary for the preceding two paragraphs, subject to resolution of the general meeting and decision by the Head Director. (Staff) The Federation may elect to have a Secretary-General and other staff. 2. the Secretary-General role may be given to a director. 3. staff member are appointed and dismissed by the Head Director. 4. necessary matters concerning the organization and operation of the Secretariat are decided by the Head Director. (Categories) the Federation may as needed appoint officers to the following positions. 2. each of the above shall be appointed by decision of the Head Director, with consent of the board of directors. 3. each of the above appointee shall answer to enquiries from the Head Director regarding the activities of the Federation and issue reports/recommendation as needed. (Types of Assemblies) The General Assembly of the Federation may take the two following forms: Ordinary and Extra-ordinary. (Constitution) The General Assembly is constituted by the assembly of full members. (Rights of the General Assembly) the General Assembly votes on the following matters. (Schedule of Assemblies) the ordinary General Assembly every year within 3 months of closing the previous exercise. (Convocation) except in the case mentioned in Art. 25.2. (3) above, the Meeting of the General Assembly shall be called by the Head Director of the Federation. (2) of Art. 25.2, the Head Director shall call the meeting within 7 days of being notified of the need thereof. 3. Meetings of the General Assembly shall be notified by an e-mail indicating the date, time and location of the meeting, to be sent at least 5 days prior to the meeting. (Chairman) a chairman of the meeting of General Assembly shall be elected among the full members attending the meeting. (Quorum) The General Assembly cannot convene unless more than half of the full members are in attendance, except if the total number of full members exceeds 100persons, in which case the General Assembly can convene as long as more than a tenth of the full members are in attendance. (Voting) Matters to be discussed shall be scheduled in advance and notified in writing in the email mentioned in Art.26.3. 2. Decision at the General Assembly shall be taken in accordance with the provision of these Articles of Incorporation, and by decision of the majority of the full members in attendance. In case of tie, the Chairman will make the decision. Notwithstanding the above, decision pertaining to changes in grade certification rules shall be taken via unanimous decision of the presents. (Voting rights, etc.) All full members shall have an equal vote in the General Assembly. 2. If for unavoidable reasons, a full member can not attend the General Assembly, he/she can vote in writing or e-mail on the schedule topics, or delegate his/her vote to another full member acting as a proxy. 4. For a resolution of the General Assembly, full members having a special interest in the matter discussed shall be excluded from the vote. (Minutes) Proceedings of a meeting of the General Assembly shall be minuted. The minutes shall compriser the following items. 2. Minutes must be signed or stamped by the chairman and at least two witnesses elected during the meetings. (Constitution) The Board of Directors is constituted of directors. (Rights and Powers) aside for matters set out in these Articles of Incorporation, the Board of Directors is empowered on the following matters. (3) Pursuant to the provisions of Article 15, 5 (5), per convocation by the Auditor. (Convocation) Meetings of the Board of Directors are called by the Head Director of the Federation. 2. When meetings are called pursuant to Art. 34 (2), the Head Director shall call the meeting within 7 days of being notified of the need thereof. 3. Meetings of the Board of Directors shall be notified by an e-mail indicating the date, time and location of the meeting, to be sent at least 2 days prior to the meeting. (Chairman) The Head Director act as chairman of the meetings of the Board of Directors. 2. Decision are made by majority of the total number of Directors. In case of tie, the decision is made by the chairman. (Voting rights, etc.) Each Director shall have an equal vote at the Board. 2. When a director cannot attend a meeting of the Board of Directors due to unavoidable reasons, he/she can vote in writing or by e-mail on the pre-notified topics for decision. 3. A director voting under the arrangement described in the above paragraph shall be deemed to be attending the meeting of the Board of Directors. In case a Director proposes an item to be resolved by the Board of Directors and all the Directors who is entitled to vote show their intention to agree on such item in writing or by electromagnetic record, such item shall be regarded as resolved at the meeting of the Board of Directors. For resolution of the Board of Directors, directors having a special interest in the matter discussed shall be excluded from the vote..
(Minutes) Proceedings of meetings of the board of directors shall be minuted. Minutes shall comprise the following. (Composition of assets) The assets of the Federation consist of the following. Assets of the Federation as assets linked to non-profit activities. (Management of assets) the Head Director of the Federation is in charge of managing the assets of the Federation. To do so, he/she seeks resolutions of the General Assembly. (Principle of accounting) Accounting of the Federation shall be carried out in accordance with the principles set forth in the Article 27 of the Act of each item. (Categorization of accounting) Accounting of the Federation is categorized as accounting pertaining to business related to specific non-profit activities. (Yearly plan and budget) The Head Director of the Federation shall prepare every fiscal year a yearly plan and corresponding budget, which shall be presented for approval at the meeting of the General Assembly. (Provisional budget) Notwithstanding the provisions of the preceding article, when the budget cannot be presented due to unavoidable reasons, the Head Director, through a vote of the Board of Directors, may propose a provisional budget linked to the previous exercise budget, until such day a budget can be presented. 2. 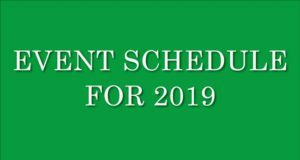 Revenue expenditures part of a provisional budget as set forth in the preceding paragraph shall be considered part of the newly established budget, once approved. (Setting up and usage of reserve fund) to face over-budget or off-budget expensed, the Federation can set-up reserve funds, which must be part of the budget. 2. Usage of reserve funds be approved by the Board of Directors. (Addition and corrections to the budget) When due to unavoidable circumstances an approved budget needs amendment, the same can be done through a resolution of the General Assembly. (Business report and financial statements) The Federation must submit reports comprising a business report, property inventory, balance sheet and income statement, as soon as practicable after the end of each fiscal year. The reports, prepared by the Head Director of the Federation, must be checked by the auditors and approved by a vote of the General Assembly. 2. When a fiscal year closes on a profit, the same must be carried forward to the next fiscal year. (Fiscal year) the fiscal year for the Federation shall begin on April 1st of each year and ends on March 31 of the following year. (Liabilities, etc.) In addition to what is provided by the budget, the borrowings, or incurrence of liabilities / waiver of rights must be approved by the General Assembly. (Change to the Articles of Incorporation) Aside for minor changes that can be approved by consent of ¾ of the full members in attendance of a meeting of the General Assembly, any changes to the Articles of Incorporation are subject to approval by the relevant government agency, as per article 26.3 of the Act. (Dissolution) The Federation shall be dissolved in the following cases. 2. dissolution by virtue of item (1) above shall be subject to decision by the General Assembly, with a number of vote in favor equivalent to 3 quarter of the full number of full members. 3. dissolution by virtue of item (2) above shall be subject to obtaining a certification of the government agency to that effect. (Ownership of residual assets) in case of dissolution of the Federation, any remaining assets shall be transferred to another NPO pursuing a similar purpose. (Merger) merger with another organization is subject to decision by the General Assembly, with a number of vote in favor equivalent to 3 quarter of the full number of full members, as well as to obtaining approval from the relevant government agency. (Jurisdiction) disputes involving the Federation of any organization part of the Federation and with respect to Kudo competition, shall be resolved by the Court of Arbitration for Sport, located in Lausanne, Switzerland.